Read and retain the enclosed patient information leaflet. The same instructions apply for adults, the elderly, babies and children. 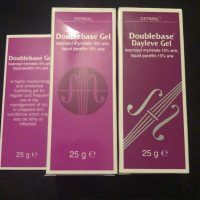 Gently apply Doublebase Dayleve Gel to the affected areas morning and night, or as often as required. Active Ingredients: Isopropyl Myristate 15% w/w, Liquid Paraffin 15% w/w. Other Ingredients: Glycerol, Povidone, Carbomer, Sorbitan, Laurate, Triethanolamine, Phenoxyethanol, Purified Water.